The system setup. Credit: Xiaoyu Ma and Yong-Lei Wang, courtesy of the University of Notre Dame. But a magnet-controlled "switch" in superconductor configuration provides unprecedented flexibility in managing the location of vortex filaments, altering the properties of the superconductor, according to a new paper in Nature Nanotechnology. "We work on superconductors and how to make them better for applications," said Boldizsár Jankó professor in the Department of Physics at the University of Notre Dame and co-corresponding author on the paper. "One of the major problems in superconductor technology is that most of them have these filaments, these tiny tornadoes of supercurrent. When these move, then you have resistance." Researchers have been trying to design new devices and new technologies to "pin," or fasten, these filaments to a specified position. Previous efforts to pin the filaments, such as irradiating or drilling holes in the superconductor, resulted in static, unchangeable arrays, or ordered arrangements of filaments. A new, dynamic system discovered by Jankó and collaborators will enable ongoing adjustments, altering the material's properties over time. The results of the research were published June 11 in Nature Nanotechnology in a paper titled "Switchable geometric frustration in an artificial-spin-ice/superconductor hetero-system." The collaborators' solution overlays the superconductor with an artificial spin ice consisting of an array of interacting nanoscale bar magnets. Rearranging the magnetic orientations of those nano-bar magnets results in a real-time rearrangement of the pinning on the superconducting site. This makes possible multiple, reversible spin cycle configurations for the vortices. Spin is a particle's natural, angular momentum. Asymmetric DC transport behavior of FQs under Type-III MC configuration at B/B^Φ = 0.5. Credit: Xiaoyu Ma and Yong-Lei Wang, University of Notre Dame. "The main discovery here is our ability to reconfigure these spinning sites reversibly and instead of having just one spin cycle configuration for the vortices, we now have many, and we can switch them back and forth," Jankó said. The magnetic charges have the same pinning effect as drilled holes in other systems but are not limited to a static configuration, he described. For example, the magnets could be arranged to create more or less resistance in the superconductor. The elementary unit potentially could be combined into a circuit capable of logic manipulation. 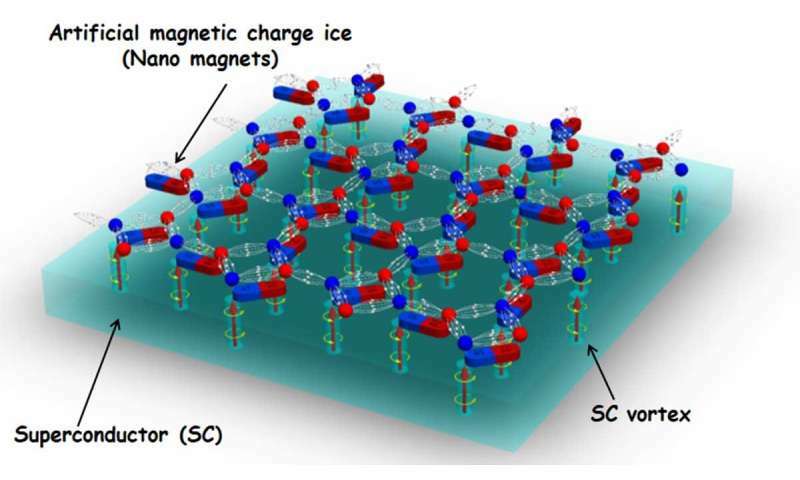 "We demonstrated that unconventional artificial-spin-ice geometries can mimic the charge distribution of an artificial square spin ice system, allowing unprecedented control over the charge locations via local and external magnetic fields," Wang said. "We show now that such a control over magnetic charges can be exploited in the control of quantum fluxes in a spin-ice/superconductor heterostructure." He added that the success resulted from close collaboration between experimentalists and theorists. 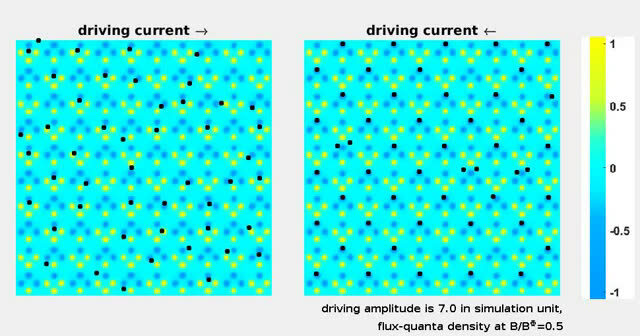 Because the control of the quantum fluxes is difficult to visualize in an experiment, simulations were required to successfully reproduce the results, said Xiaoyu Ma, a doctoral student in the Department of Physics who conducted the computer simulation in the study and is the co-first author on the paper. The simulations allowed researchers to see the detailed processes involved. "The number of vortex configurations that we can realize is huge, and we can design and locally reconfigure them site by site," Ma said. "This has never been realized before." The research is expected to provide a new setting at the nanoscale for the design and manipulation of geometric order and frustration—an important phenomenon in magnetism related to the arrangement of spins—in a wide range of material systems, Wang noted. These include magnetic skyrmions, two-dimensional materials, topological insulators/semimetals and colloids in soft materials. "This could lead to novel functionalities," Wang said. "We believe this work will open a new direction in application of geometrical frustrated material systems."